The soft tissues in our body consist of Muscles, Tendons and Ligaments. It is highly likely that during the course of your life you may have suffered an injury in one or all of these structures, especially if you are or have been an active individual involved in sports. Soft tissue injuries can range from minor to severe and your recovery would be dependent on the type of structure involved and the severity of the trauma. No matter how severe the injury is, it is highly recommended to consult a health professional in order to determine the best possible management plan for an optimum recovery. All soft tissues heal differently and a supervised physiotherapy approach can not only help with the management, it can also ensure better long term function and prevention of future re-injury. No matter what the injured structure, an initial management approach involves Rest, Ice, Compression & Elevation (R.I.C.E) of the injured structure until further medical advise is attained. Muscle Spasm: A muscle spasm is a protective mechanism of our body which attempts to limit movements in certain joints in order to give an injured structure time to heal. The brain reminds our body not to move by causing pain in certain movements! Muscle Strain: A muscle strain is an injury where some muscle fibers are torn, predominantly due to overloading or a direct injury. It is not recommended to get a massage in the early stages of a muscle strain as it can have a negetive effect on the healing. DOMS: Delayed Onset Muscle Spasm (DOMS) is a common yet painful condition which commonly occurs after excessive or unaccoustomed exercise. The condition usually resolves itself within a week. It is safe to exercise with DOMS. Recovery: Muscle injuries normally require 3 - 6 weeks to heal depending on the sevirity. Commonly Injured: Achilles, Hamstring, Rotator Cuff, Patellar tendon, Wrist extensor (tennis elbow), Gluteal tendon. Reactive Tendon Injury: This type of tendon injury occurs when the tendon undergoes excessive stress in a short period of time. Commonly seen in people who attempt to play a sport or go running after long periods of no activity. Activity modification usually resolves the symptoms. Degenerative Tendon Injury: This type of tendon injury occurs with repetitive trauma to the tendon over months or years. 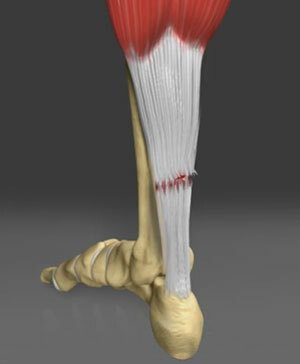 It requires a more dedicated approach to rehabilitation to resolve the symptoms and to strengthen the tendon. Symptoms: Tendon related pain is normally experienced before playing or activity. Once warmed up, the symptoms disappear, only to return afew minutes or hours after activity is stopped. Recovery: The recovery depends on the type of tendon injury and symptom resolution can take between 10 days to afew months. A structured rehabilitation approach can ensure optimum recovery. Common Injury: Ankle ligaments, Anterior Cruciate Ligament (ACL), Medial Collatral Ligament (MCL), Posterior Crutiate Ligament (PCL), Shoulder ligaments. Ligament Tears: Ligament tears require some form of immobilization and rest in the early days of the injury. As ligaments attach bone to bone, a severe injury causes joint instability and in some instances can even cause an avulsion fracture where the bone is chipped off. Common Signs & Symptoms: A ligament injury is associated with pain, swelling and inability to put weight on the joint. Recovery: Ligament recovery usually takes 3 - 6 weeks. However, it is highly recommended to undergo a structured rehabilitation program in order to avoid long term problems such as joint instability or long term residual pain.